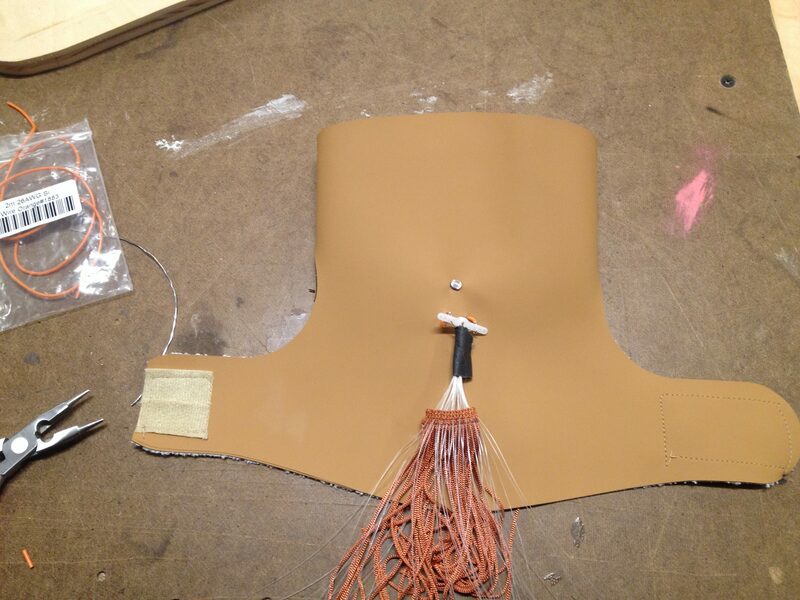 wearables – week 10 / almost there! 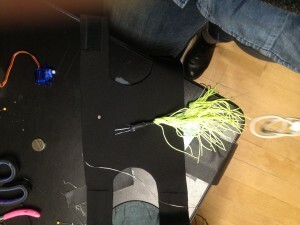 I was still struggling with the servo motor and the fringes. 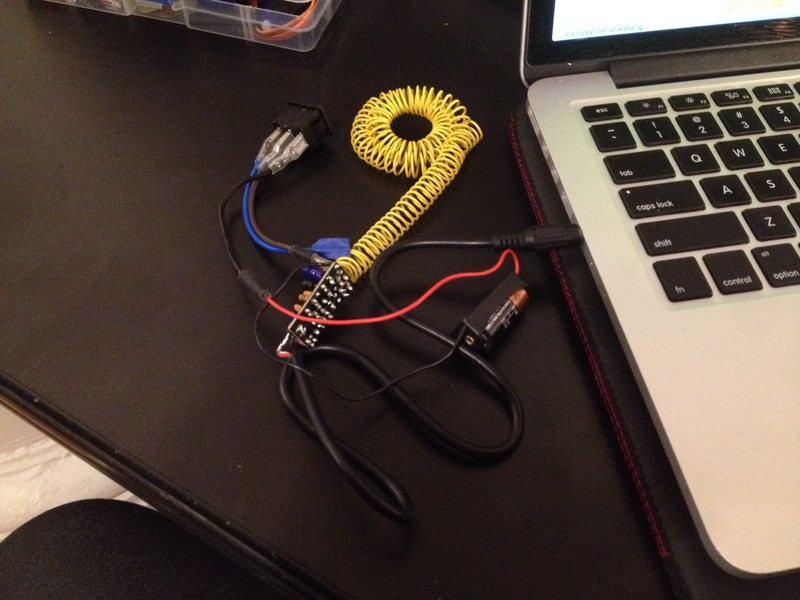 I kept on trying with the motor, trying different libraries to make it work with the attiny85 but nothing worked. So I decided to put it aside and go back to the fringes. Me and Jordan went to “Shape Changing Materials” workshop held by Wearshop and Nomena on the first weekend of April. While I was there, I got some feedback over the project and decided to give one last shot for the reflective band + photoluminiscent thread. When you put them under light (artificial or natural), they become photoluminscent. 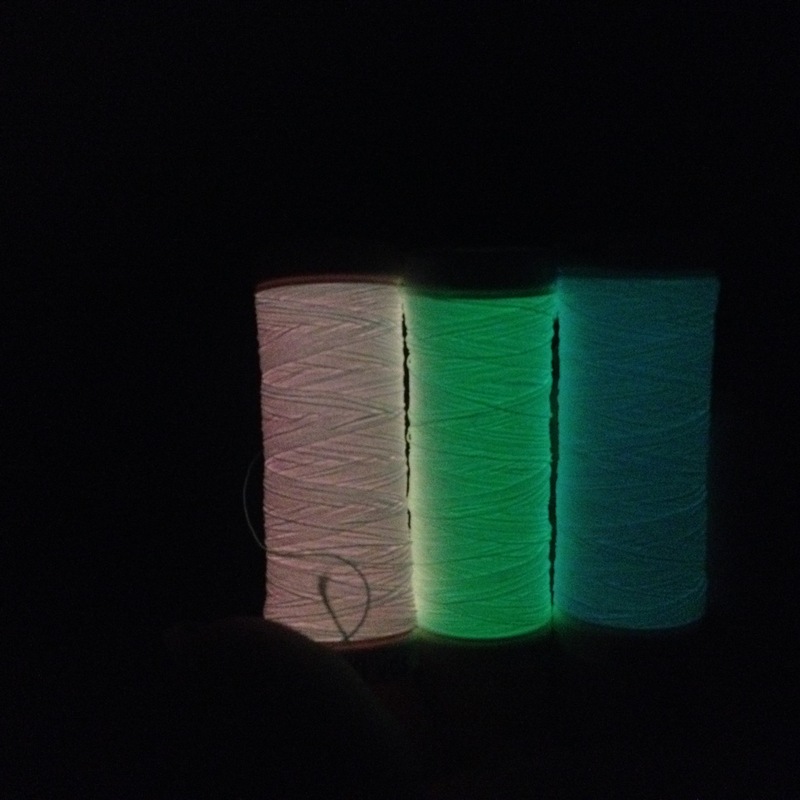 So I sewed the photoluminescent thread on the reflective ribbon and it wasn’t bright enough. I decided to keep with the fringes and I’ll try a technique with hot glue to weight it and illuminate the fiber optic better; also last week’s guest speaker gave me the tip that I should reach Corning for their Diffused Fiber Optic. 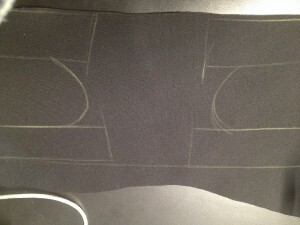 So it’s time to fabricate with the real materials! At least to have a prototype closer to the final thing and be able to see where I have to make it better. I’ve decided that my aesthetic is a “a punk haute-couture” acessory. 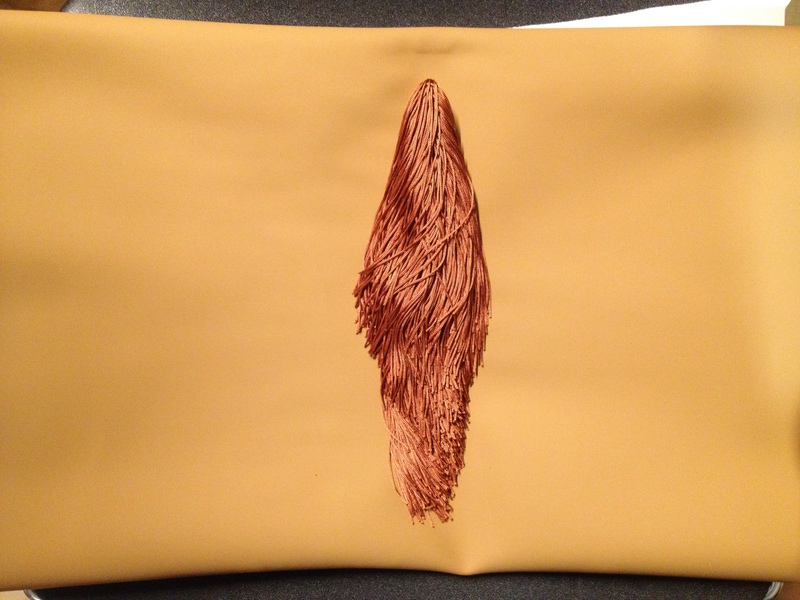 I got a vinyl fabric that looks like a matte leather and it stretches in one way. To have a nice and clean cut I went to the Cameo Sillouette cutter we have a t the soft lab and started testing the cutting settings & sizes. 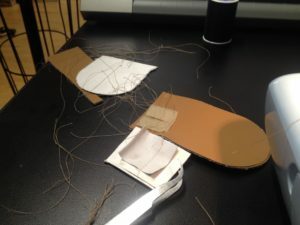 it is a pretty easy machine to use, the trickiest part for me was that the cutting mats were all worn out and didn’t have enough adherence to make the vinyl stick to it – leading to a few blobs while cutting and double cuts with different origins. 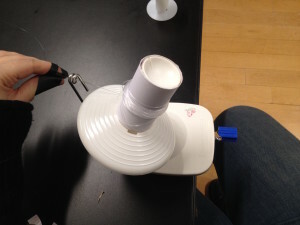 and when I fit the photocell and the servo mount with the fringes…it didn’t work. I’m still trying to figure out why it didn’t work, but I’ve noticed that often the circuit behaves weirdly, so I have to figure this out. 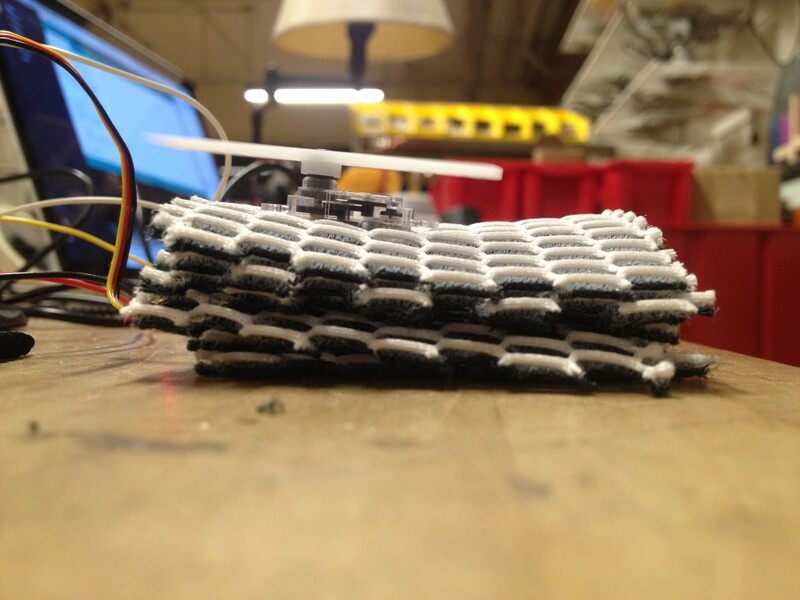 But the circuit is working, I have an assembling/fabrication pretty clear – is just a matter of stabilizing things. when it’s all together. Last class, one thing Despina said is that even if we don’t have our product finished the important is to have the experience finished. I rethought about the idea of having a glove with a switch and…this is not what I was looking for at first. I went back to my core requirements and definitely practical / organic is in the scope. 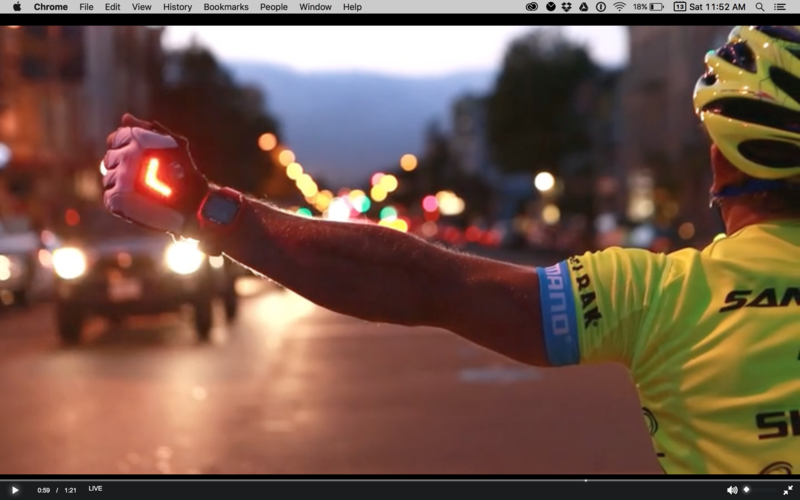 I want bikers to use it without having to think how they will turn the fringes on or off. On this perspective, the lighting part is doing is job; the movement in the fringes is what I want to also be as effortless as possible. So for the final presentation, I’ll just “fake” the experience. Like I’ve said before, my goal is that the signalization system can anticipate when you are going to turn (not when you are turning). 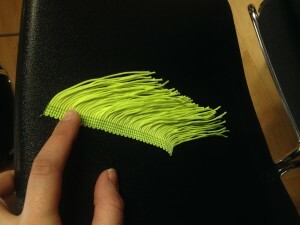 This week I kept on testing the fringes, using more fiber optic as well as reflective fabric. 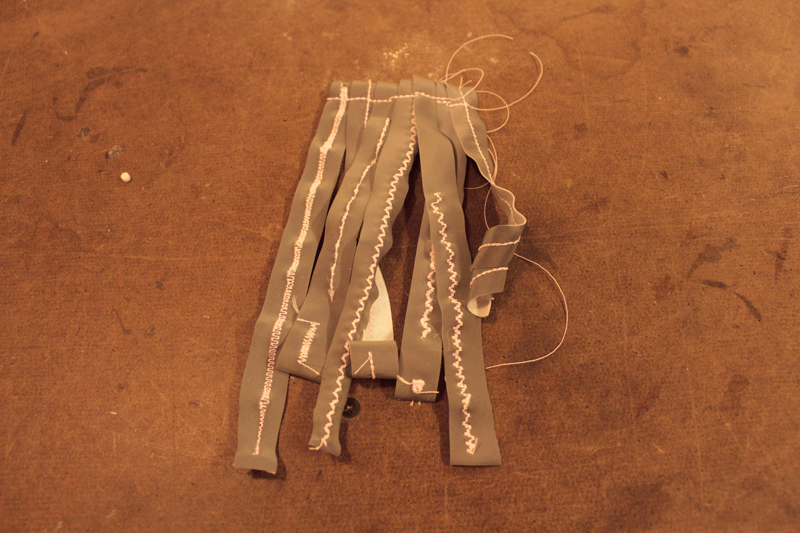 I cut the reflective ribbon in thinner ribbons and sew it in the back of the fringe.  It gave the fringe more structure but lightning wise it didn’t make it brighter. 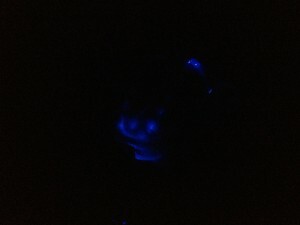 I also tested adding a second layer of optic fiber and it lights up better, but it’s still not too bright. I’m struggling to find a way of making this system to work (make the fringes brighter!) 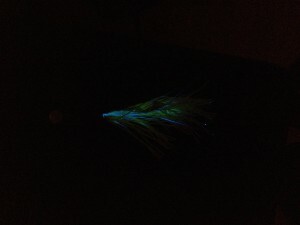 and therefore I’ll try to test to make the fringes with photoluminescent thread. 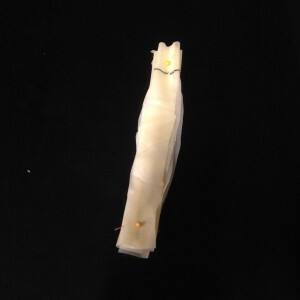 Personally I prefer the fiber optic aesthetic and I feel that the fiber optic can work if I add more layers but it also takes a lot of time due to the preparation process (cutting, sand papering, going through the fringe’s holes, gathering all fiber optic, glueing it and attaching to the LED – around 4 hours in a 5cm fringe). my tiny servo arrived and I’m very excited about it! 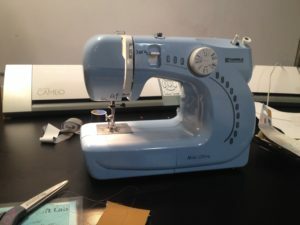 I started testing it with the Arduino Uno and it works great; with the Lilytiny I’m still trying to figure out what is happening because it doesnt look like its obeying the code (although it is spinning). 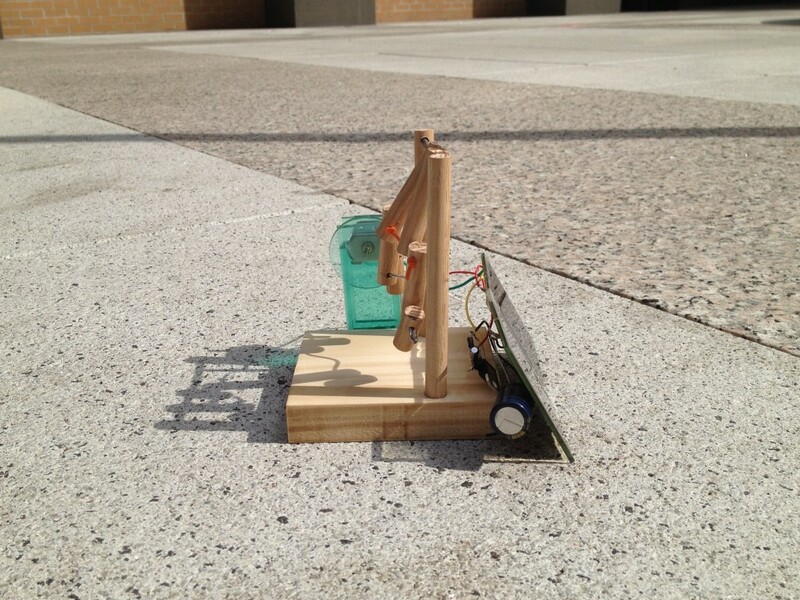 I’ll reach for the residents and other students that have done prjects with servos and attinys this week. after doing some tests, I’ve realized that I’ll need at least 5V to power my circuit (specially because the servo needs at least 4.8V to work). I checked and the attiny can take up to 5.5V. I tested the circuit with the bench power supply and for some reason the servo was not driving any current – I guess this has to do with the buggy servo library for attinys, hopefully this will be fixed soon. But in any case, it will be more likely that to power it up I’ll be using two 3V coin cells in series (~ 6V). so after I was working this week on the elbow patch I realized I had forgotten something very important… how am i going to turn the circuit on and off?! I was mesmerized on how I just blanked it from my mind and since I started the project I’ve been biking more, so this week I was just observing my own movements to see what kind of movement I could do to turn it on/off. 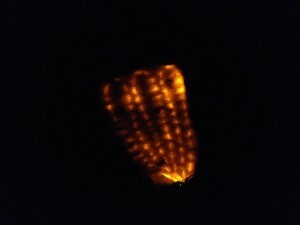 I’ll prototype a fingerless glove with some button within in to see how it feels because the hands seems to be the best place to put it (specially because there are some areas of it that you never touch). 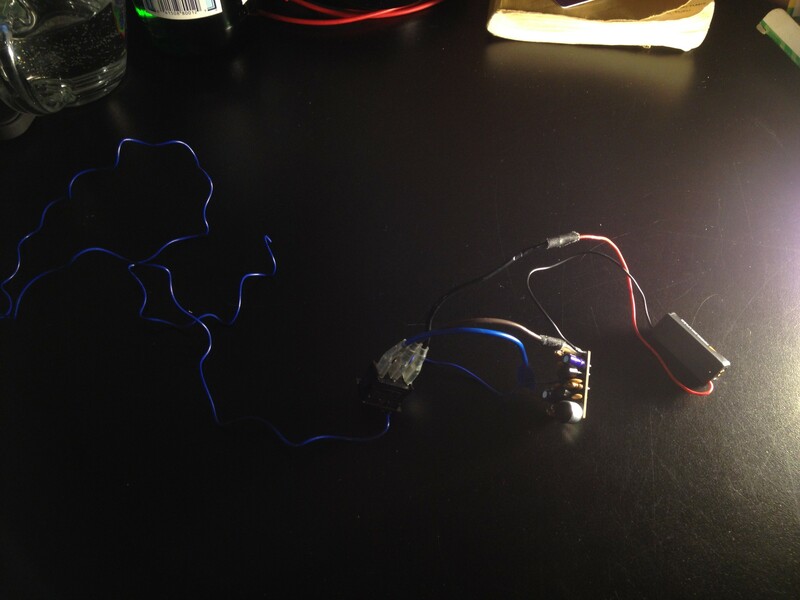 last last week I focused on making the circuit to work – servo, photocell and LED. and it worked. I started testing it with an Arduino Uno, but for the elbow patch I need to size it down, in a way that the whole circuit can be inside it. 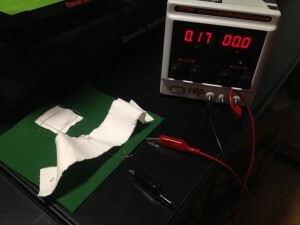 So I decided to try one of the sewable microcontrollers and use the technique of stacking up (Pibow is a good example) a soft and thick material to be sure the circuit would have all the elements in place and safely cushioned. i tried using the arduino gema at first but for some reasons things didn’t work well – and in the end, I accidentaly shortened it while soldering wires on the board. a bit frustrated, I gave me a time out of this and restart with a clear mind. and so I decided to start with something a little bit more trickier to set but better on the size: a lilytiny board (sewable pcb with an attiny85). after setting the arduino software, I started doing some tests bootloading the microcontroller. one great thing about it is that the synthax is pretty much the same, so is just a matter of knowing which pins are digital and analog and pluging things properly. and then I tried working with the servo motor. (ps: I ordered a servo that I’m very excited about using because it’s height is the same as a penny) and it’s not working properly. it looks like it is sending the signal, but there is not enough power to make it work the way it was on the arduino board. I’ve been talking with some colleagues that have done projects with attinys and servos, hopefully i’ll get this to work (with the tiny servo) this week. along with the circuitry, I was also thinking about the aesthetic of the patch…but I didn’t know how I wanted it to look. I knew I wanted to keep on working with the fringes + optic fiber , but i had no clue on what kind of fabric I wanted the structure to be. and so I went to mood and got very inspired by a vinyl fabric they had there. 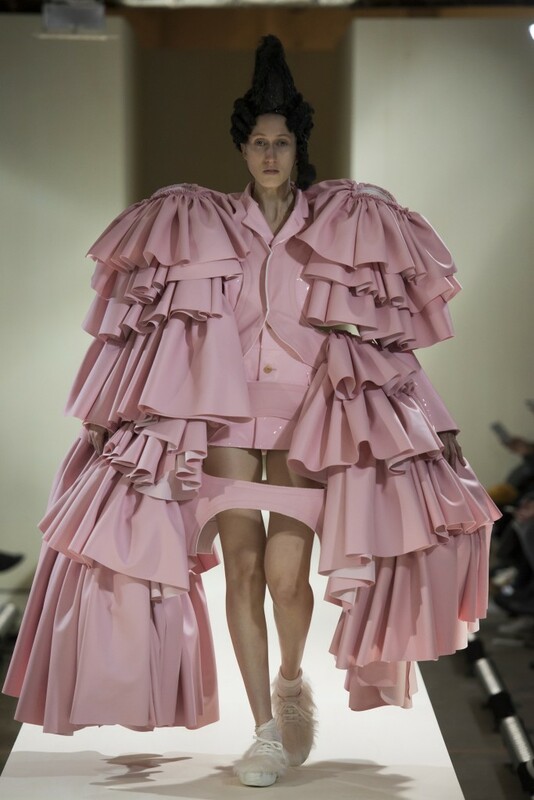 it looks like a matte leather and as soon as i found it, it hit me – the elbow patch will be a luxury fashion statement,an haute-couture accessory for female commuters. 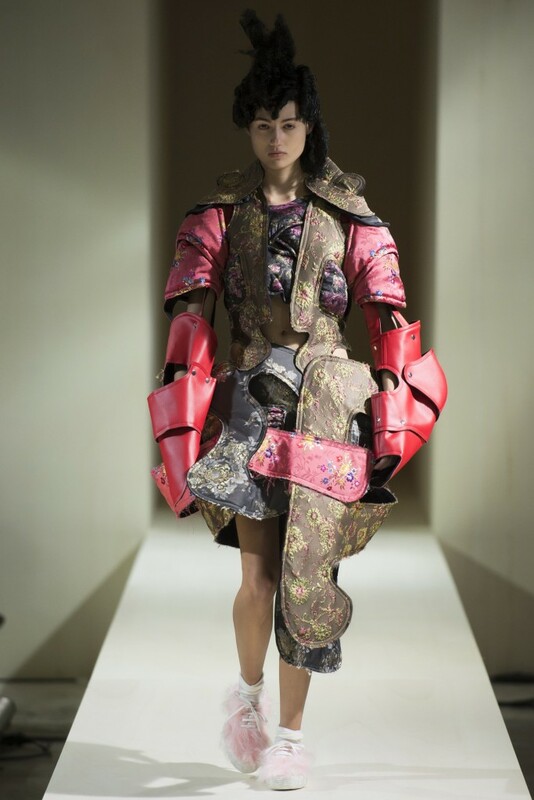 and after talking with Viniyata (a dear ITPers friend), I found that I could find a lot of inspiration on Comme des Garçons Fall 2016 show in which Rei Kawakubo imagines punks on the 18th century, so inspiring! and I believe those two looks below are related to what I’ll try to reach within the next weeks. For radio ga ga’s final, I decided to do a sound installation using brazilian sociologist Luiz Eduardo Soares work about invisibility. His essays published on the book Cabeça de Porco addresses the topic on the light of brazilian society’s perception and stigma over kids that were born and raised in underprevileged communities in Brazil. 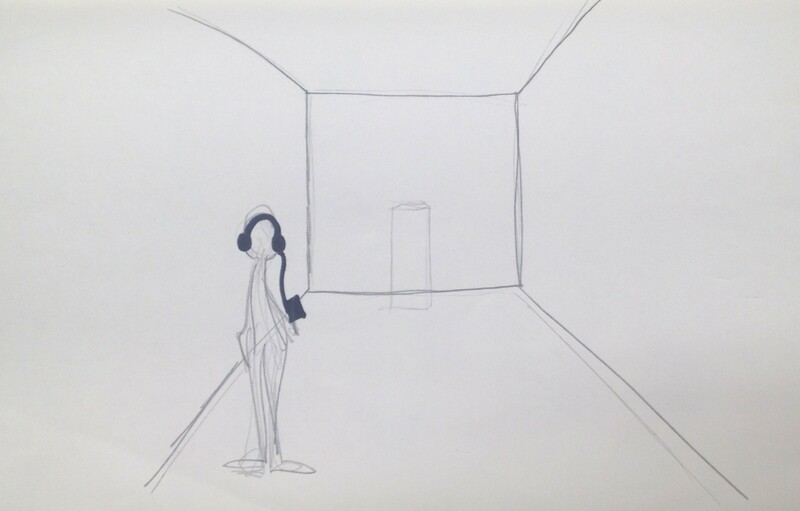 Working with an apparently empty space, the user gets in a room and is given a listening device. Through radio transmition and emition, two different frequencies that alternate each other are transmitting synched audio recordings of a woman (reference to the unclear goal of numbers station) reading the essays – in english and in portuguese. 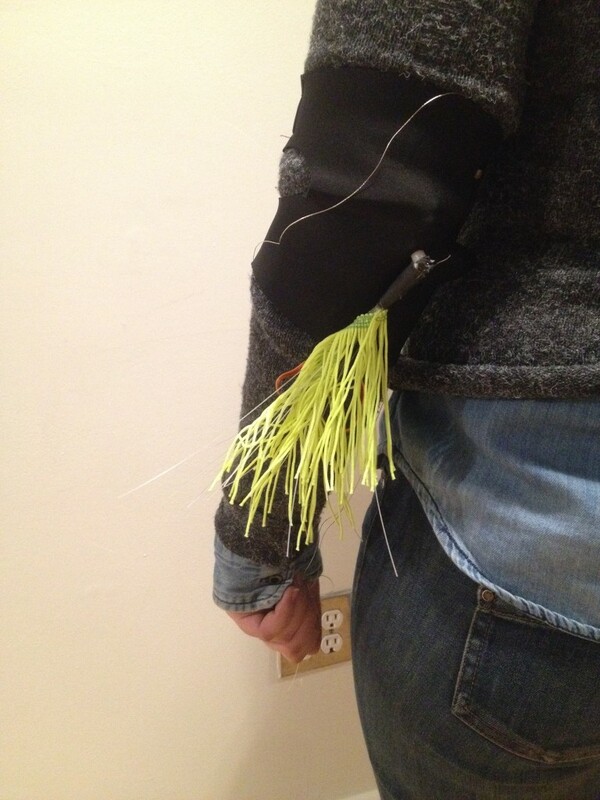 As the public walks in the room, the listening device will hop between the frequencies, creating intentional noise to the understanding of the essay by making it understandable/visible or obfuscate/invisible in different areas of the room. 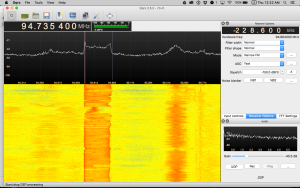 So the first thing I tried was to receive/listen signals with GQRX + RTL-SDR radio set. After a few software updates and installed it worked fine. 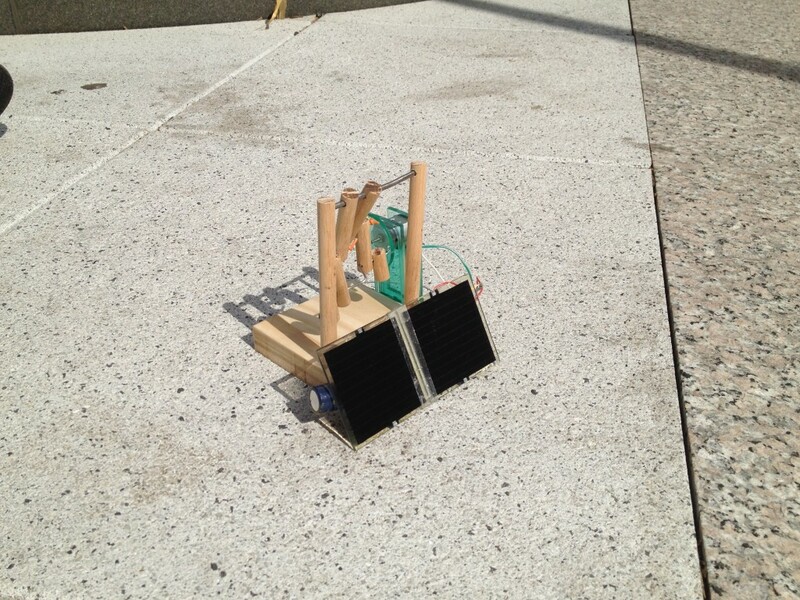 So I went to the other challenge: to transmit radio signals. 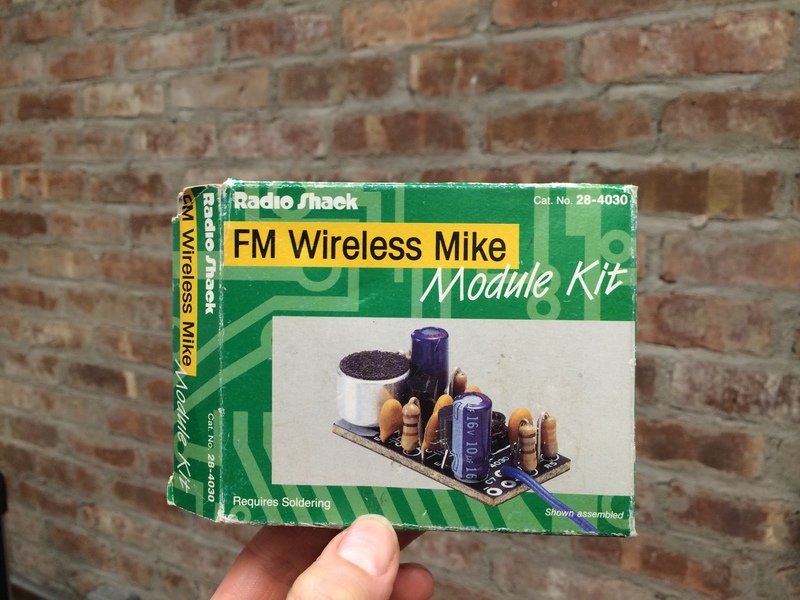 I reached out to the student list and I got this 80s Radio Shack FM wireless mike transmitter. It was very insteresting to see that it all came to be assembled – and how basically to make a radio transmitter is just a matter of putting a bunch of capacitor, resistors and antenna together. I thought there was a chance of it doesn’t work because I have no idea when Radio Shack had that logo, but it worked ! After this experiment, I came with it to class and Surya brought a few questions to me: was I able to stabilize the frequency transmission? Is the antenna the right length? How is the output of the transmission and reception (aka what will be the experience)? So the first thing I did was to use an antenna that was the right size. For the frequency range, the antenna had to be between 3-3.20 m. So I coiled it up and went back to the GQRX to see how the signals would be. 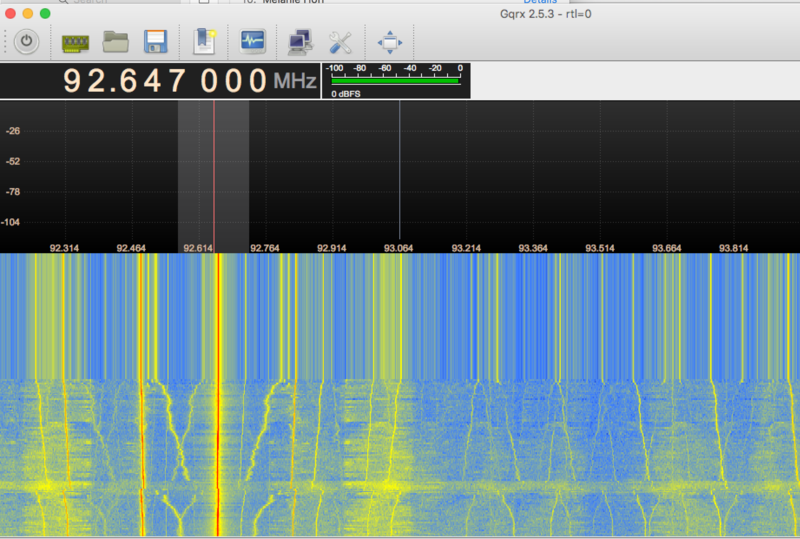 This time they were not distorting the whole range and they showed a stronger signal. And then I decided to experiment and replace the microphone on the transmitter for a jack plug. I plugged it in and turned the transmitter on as well as turned the music on on Spotify. 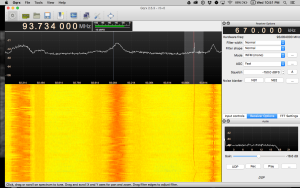 Because I was using the jack plug in to transmit music, I wasn’t able to listen to the GQRX. 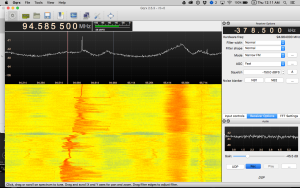 So I tried using a jack splitter, but it didn’t work – I was listening to both audios (the computer and the radio). 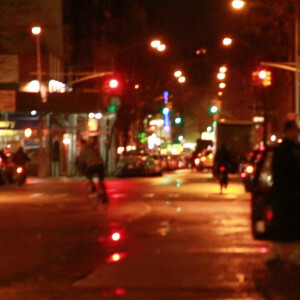 New York is a very windy city due to its grid based urban planning. There is a new urban design wave of making big cities more green. 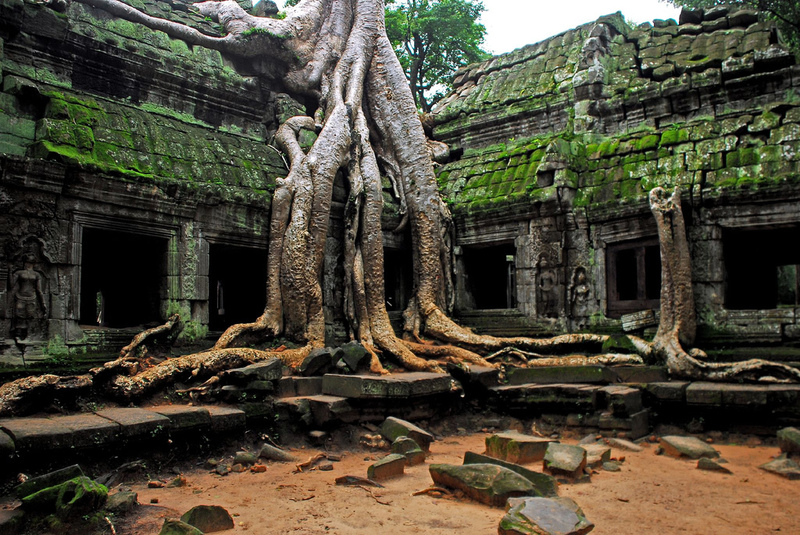 Around big cities you can see signs of “nature resistance”, in which trees invade the pavement. 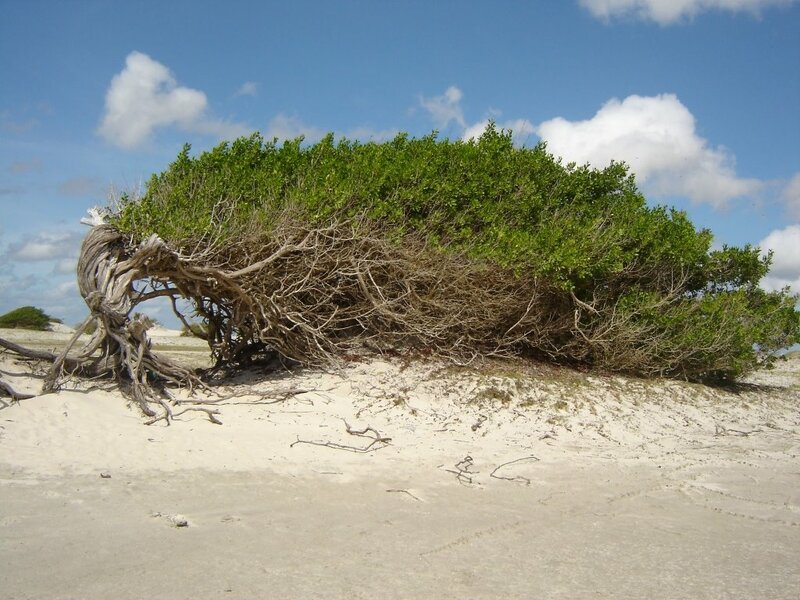 In Brazil, there is a famous tree on the northeast coast called Arvore da Preguiça (Lazy Tree), that due to the strong wind current was shaped by it – for some people, it’s lonely existence represents resistance. The installation is using the poetic idea of resistance by putting a plant through a wind “stress” situation and despite all of it, it is still there alive and growing. 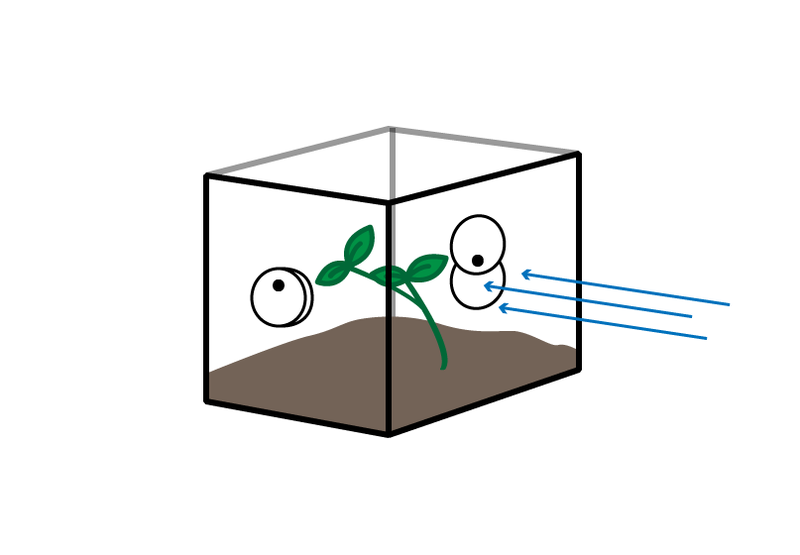 Acrylic box(es, if feasible) with four covered wholes on its sides. Inside it, there is a plant. Using the power of the wind those wholes will be open or closed; what will define which wholes are being opened is the wind direction. I’d like to place them outdoors, in the corner of a building’s balcony. 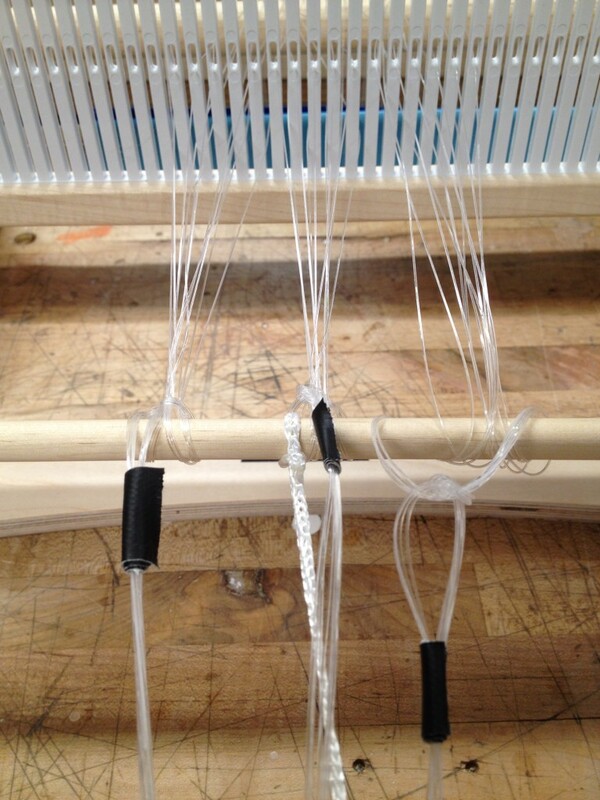 and so i started testing the optic fiber with other materials – i got some swatches and reflective ribbons at Mood , so my plan was to warp the cricket loom with optic fiber and go weaving with those materials. unfortunately the company i ordered the optic fiber didnt send it spooled and therefore i needed to spool it before starting anything (optic fiber, no matter the thickness of it, gets tangled very easily). but since i needed to file it as well, i decided to try both. at the same time. Teresa helped me because the optic fiber would get tangled anyway and at some point i just had to throw out a good amount of it because we couldn’t figure out how to untangle it. 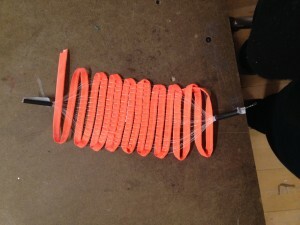 I went to the cricket loom and started warping it with the optic fiber. 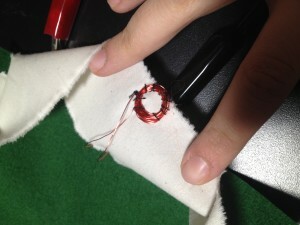 there were also some difficulties in doing it due to the fact that the fiber optic is not that malleable and the thread behaves the way it wants to. 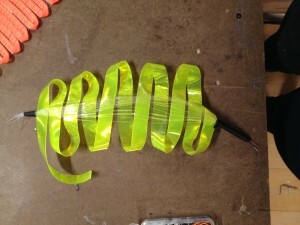 and so I started the tests with the reflective ribbons i had. but i find out that they weren’t that efficient as a material combined with the optic fiber. the yellow ribbon just didn’t light up at all. and so i started rethinking about the materials, trying to think how i wanted to narrow down the project, how i want this product to be approached and then i realized that i wasn’t finding any motivation in it anymore. i wasn’t having fun with what i had and achieving the result i had in my mind – a well finished, all occasion machine-learning product – seemed so far that i wasn’t feeling motivated. so i stepped back, talked with despina and other friends and decided to combine the positive results i had from the first prototypes to get another alternative. 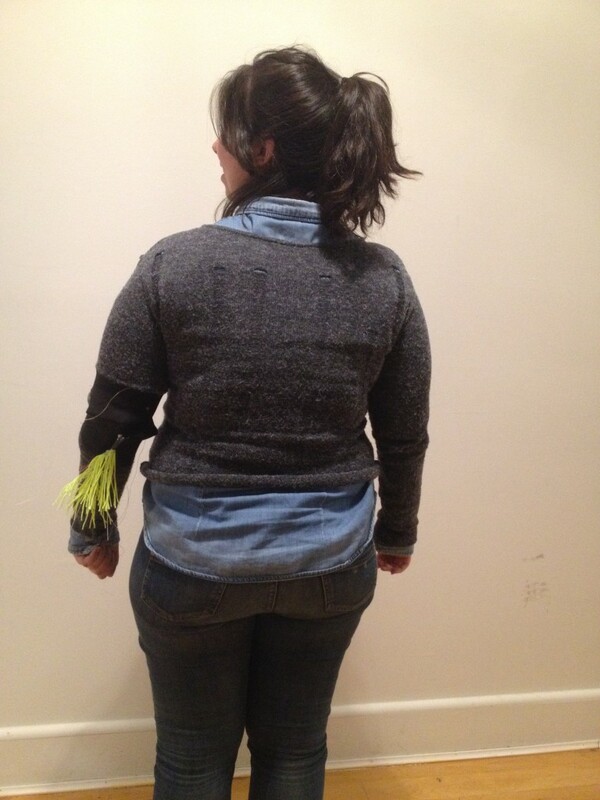 an elbow patch with fringes that signalize the biker is turning on left/right. 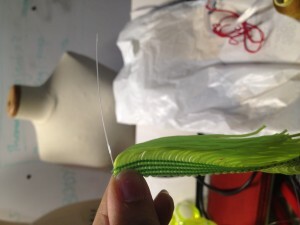 the fringes are made of bright/fluorescent color threads and optic fibers and there’s an led on the tip. 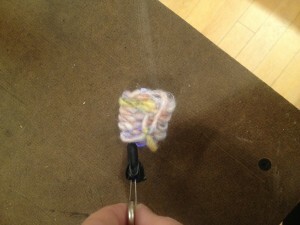 this same tip is attached to a mini servo motor and when the biker turn the servo on, it swings the fringe. 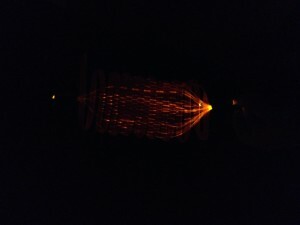 there’s a photocell in it, that captures the luminosity of the environment and inversely map it to set the led brightness, lighting up the fringe when it gets darker. 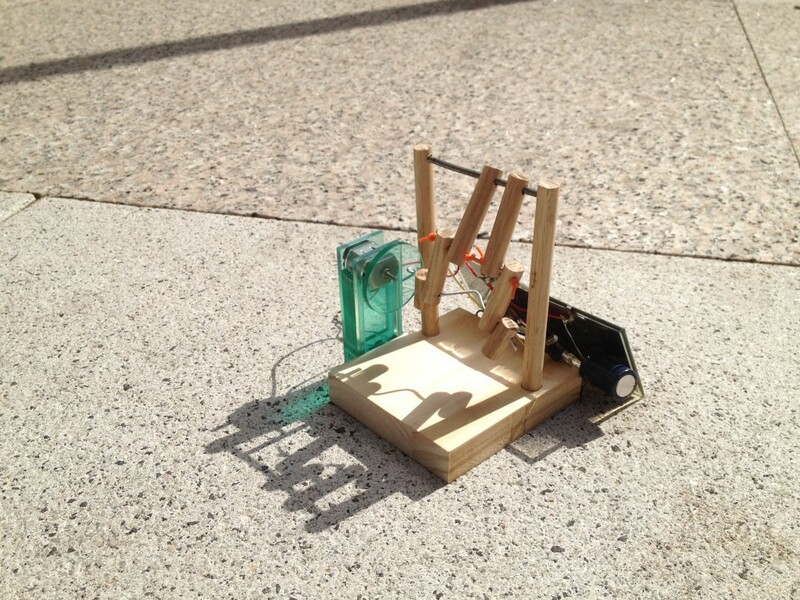 for this week’s assignment we had to build a solar powered robot. I’ve partnered with Yuan and we decided to do pedaling legs. Here’s is the second part of the documentation – the first part you can find on his blog post. after I broke down which were the requirements of my project, I was able to start sketching some possible prototypes – but before building them I went after the bikers, to shoot them while they mounted, rode and turned left or right. I was able to document 04 people and after I shoot them, I’d talk about the project & ask them if they gave any kind of signals to say they are turning left or right. All of them answered they don’t do any kind of signalization. Ideally they would, but they all forget about doing it (that includes me as well). Through the videos I could also observe that the arms, differently from what I thought, were pretty visible the whole time. But apart from being visible or not, one of my main aspects is flexibility and I want people to be able to choose where they are attaching the patches (arms, legs, back or backpack). 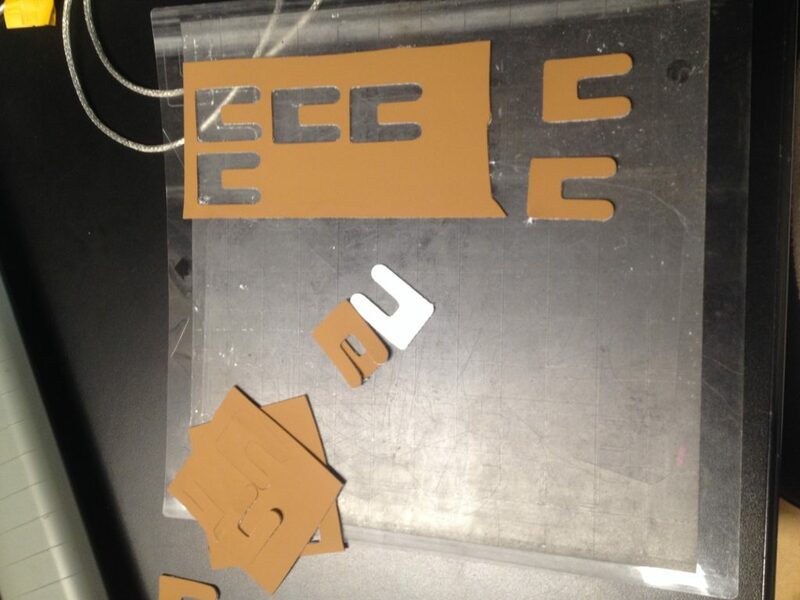 And then I started fabricating the prototypes. 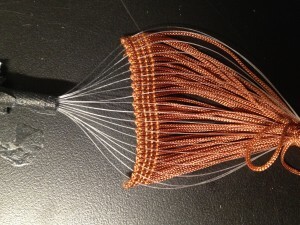 I started with the fiber optic lead that I had last week, doing a bigger version with more optic fiber. 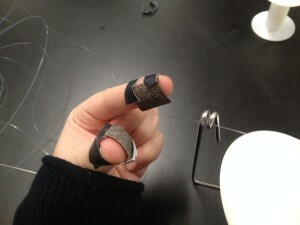 During class, Despina showed us reflective materials. I reached out to the ITP student list and a colleague had some reflective yarn that she could borrow me. 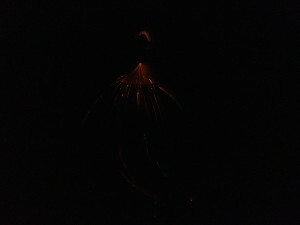 I thought that there was a chance of the reflective yarn create some interesting lightning result when weaved with the optic fiber. The result was pretty interesting, specially to see that if I know how to treat the optic fiber and if I have the proper LED + resistor it will light up very well. And as much as I was excited about this experiment, it felt very hand crafted/ too Etsy. It feels very limited to what was main purposed. This prototype is flexible and give the feeling of a fabric that is illuminated, but it doesn’t work during the day, it will be uncomfortably wet if it’s raining and th ereflective yarn didn’t make any different. A little disappointed with this experiment and trying to understand what I had forgotten on my way to this, I decided to do some new alternative options for theses gaps found in the yarn experiment. 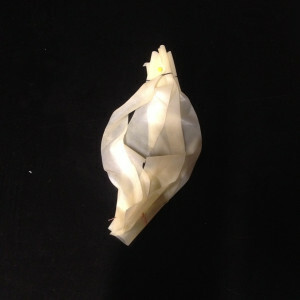 Looking around the soft lab materials, I found this latex material that was very interesting to work with. 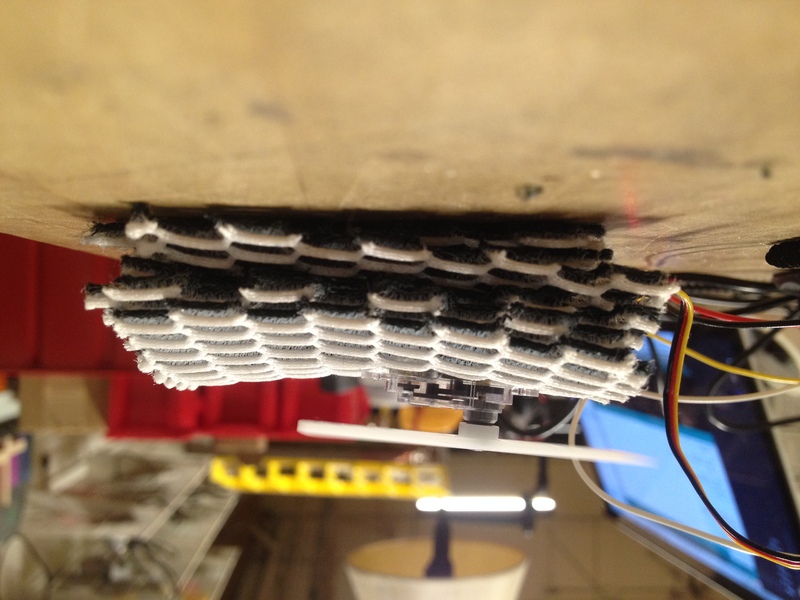 Translucid, flexible and definitely waterproof, I did this prototype just to play with shape and malleability. 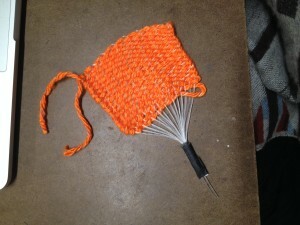 I haven’t tested any attaching system yet but I’l say this would be easy to “stick” to skin. 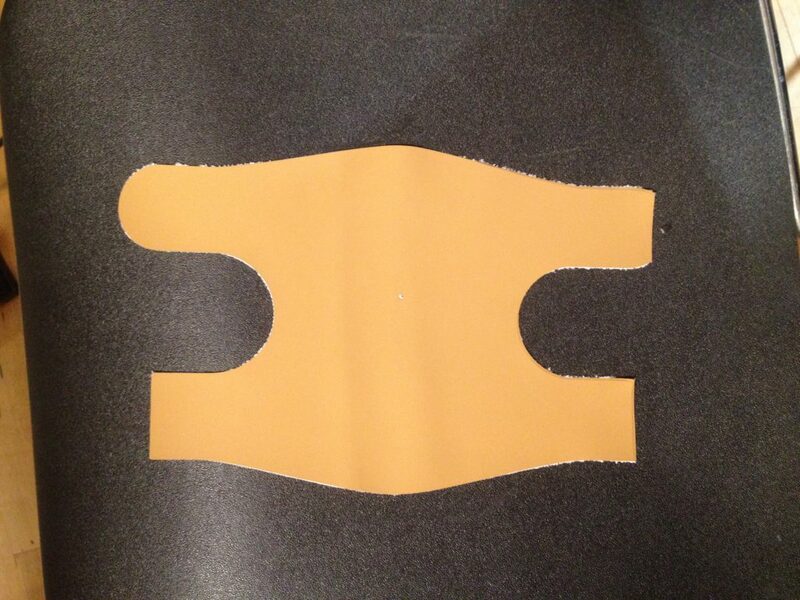 So this is a patch with folded latex stripes. — coudln’t figure out how to attache the optic fiber on it. 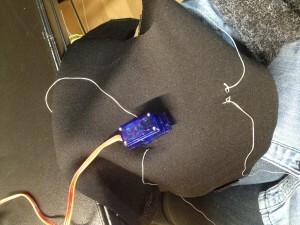 looking for possibilities within e-embroidery and wearables, i bumped into this website full of interesting DIY resources. 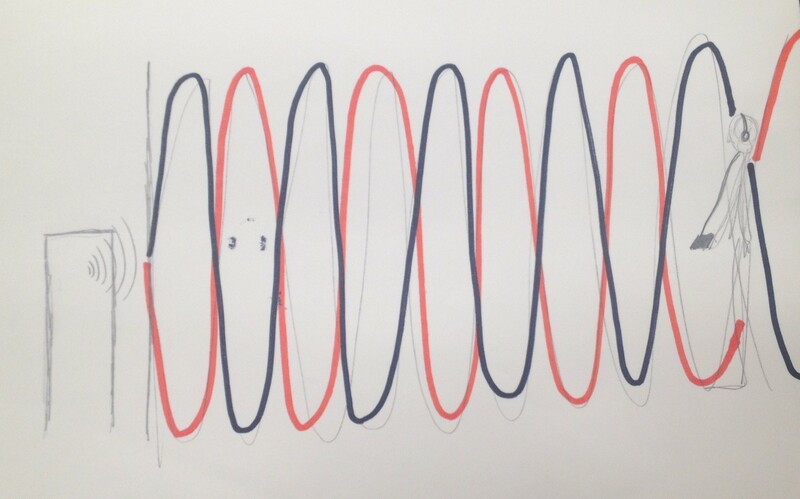 I got very interested in one of their tutorials, that showed some results of giving conductive wire/coil energy and therefore creating an eletromagnetic field: making it become a magnet. So the idea is that the biker would activate this magnet system that would change the shape of the material (in the case, creating the shape of an arrow). 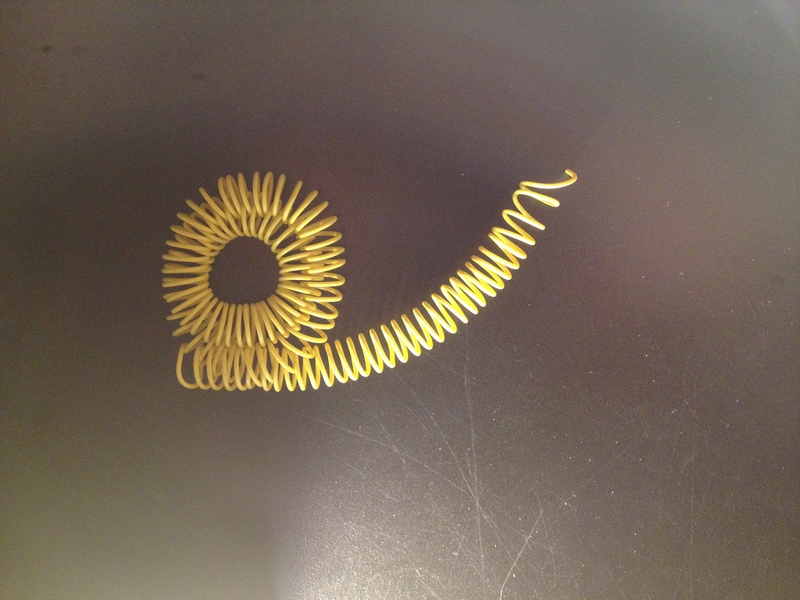 however, i had no success in energyzing the coil. i didn’t understand why, but i feel like i’d like to test more of this, it seems so promising! and then i did this very ludic alternative because I felt that this “alive” patch could be something fun & a fashion statement (like fringes ). “What is interaction? Are there different types?” gave an overall view, presenting different perspectives over the definition of interaction and other categories tightly related to it. In my opinion, I thought it was interesting to put out so many options but also made me think that is all a matter of perspective. If in theory it’s all much more complex than I ever expected to be, it becomes very clear to me why seeing those systems in practice makes it even more difficult to classify and understand them as interaction/reaction/self-regulating/closed-loop etc. So maybe is also the job of the designer to choose what is his interaction by defining precisely what is his intention ? Having a background within collaborative methodology, I feel that there’s also a part of the design process in which you have to give your product/system to the public and see how the interaction works without any instruction (There’s this very interesting article by Tom Igoe that he analyses pcomp projects and talks about hits and misses of interactive projects). What if, just like in biomimicry, we start analyzing nature cycles to design more “transcendental” interactions, less forced gestures and movements (also reminded me of a nice observation over the dangerous future that interaction design seems to be leaning towards: http://worrydream.com/ABriefRantOnTheFutureOfInteractionDesign/ ). what is my intention with this project? what kind of interaction do I want the user to have with the object? how organic or imposed this is? should it take the subject in a serious or in a fun approach? iii. think about the interaction. Last class we had to bring an object that captures the essence of our idea – with that in mind, I brought to class a raincoat, a bike back light and a pair of fingerless gloves. We went through everybody’s objects and everyone had to describe it and/or say things that it reminded, emotions that it brought up. I also hadn’t presented my narrowed version of the project, so I had the chance of doing it and I didn’t realized it was a bit everywhere. 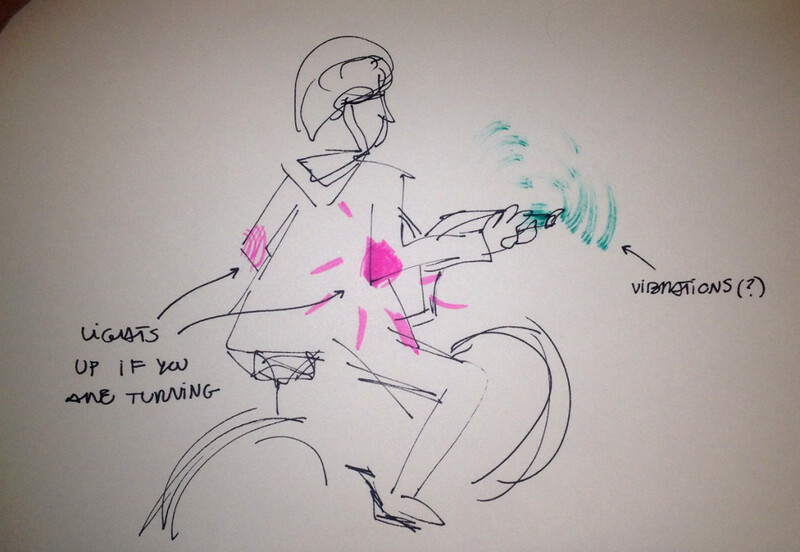 It seemed confusing to have the signal system with the gps with a sensor on the handle bar – and all powered with kinect energy made from the bike. Therefore, I decided to make just the signalization system. 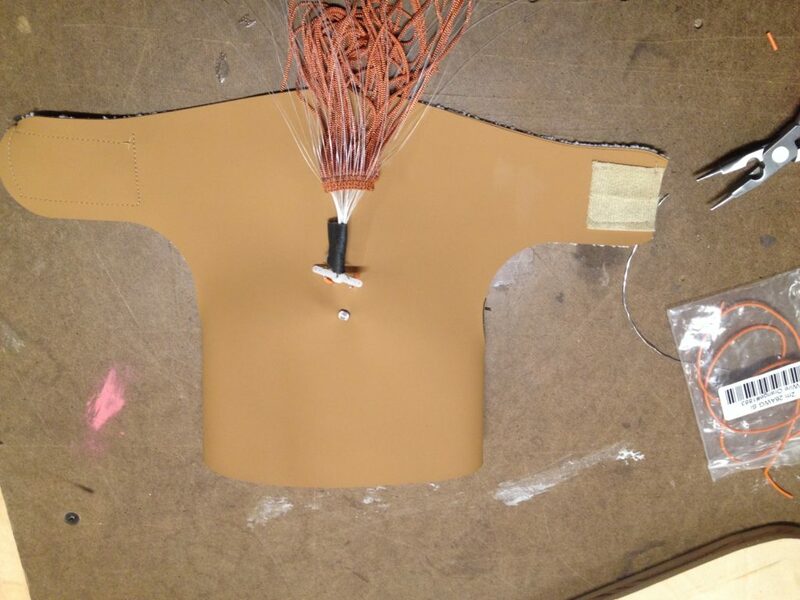 In sum, it will be a pair of sticky patches that will light up and signalize to whoever is behind the biker that he/she is turning left/right. At first I thought of doing these patches to fit the elbows but after looking at some videos and also asking biker friends/realizing how i bike that it can’t be exclusive to the elbow: some people “hide” the elbow while biking, some have backpacks etc. I went to the world wide web and started looking for similar products already existing in the market. active by actif they describe themselves as “functional and fashionable”. 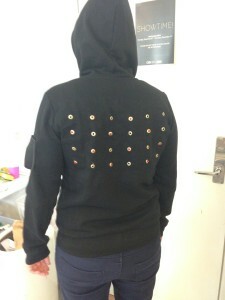 jacket that has led panels that are wirelessly controlled by a toggle switch mounted on the handlebar. DIY projects I also found some intractable projects / DIY of bike signalization: breaking gloves and turn signal biking jacket. After analyzing the feedback as well as the models available in the market, I decided that I’m narrowing the project to make it different from what is already there / and that consider above all the human factor (thanks “Design for Wearability” – old but gold). My project is a signalization accessory for bikers that has as it main purpose to promote a safer & smarter commute for every biker. 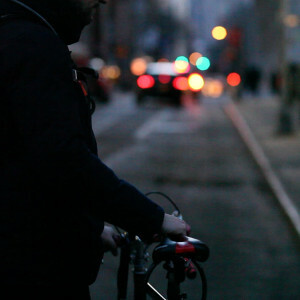 It will be a pair of patches that should be attached on visible areas by whoever is behind the biker and they will be wirelessly connected to the handlebars, where the biker will be able to activate the patches by touching some sensor/closing the circuit – making they light up and signalizing where they are making a turn. 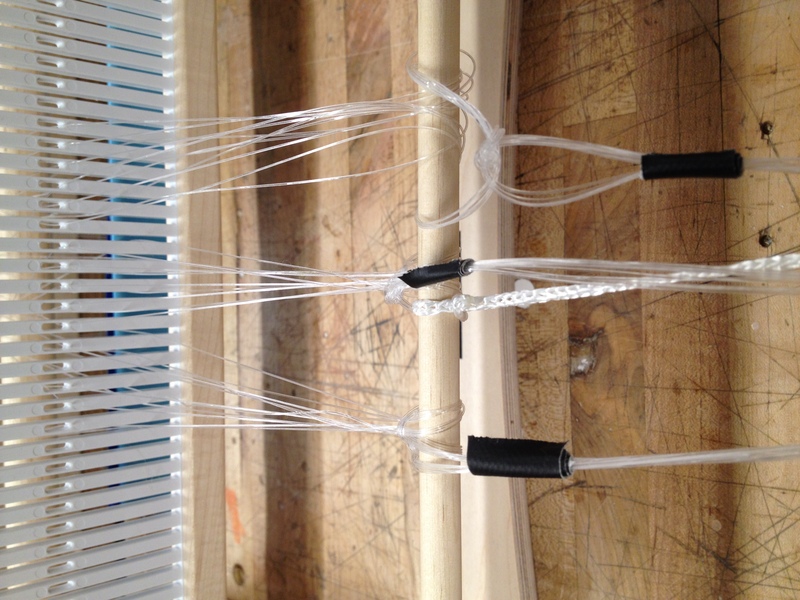 With some guidance from the requirements, I bought some optic fiber and started to weave (really) small fabrics to see how that worked. Since we read the technical report of wearables I’ve been very interested in trying to develop something that doesn’t feel like an electronic. I feel that most projects loose their strength when they just put an led on it – there are so many interesting ways of lighting things up! Obviously for the fabric I needed an led, but it was not the main lighting source: it was the optic fiber that was all light up. After some tests, I saw that when I scratch/sandpaper the optic fiber it lights up even more. 3) Think about the circuit / how energy will flow. this week’s readings were very focused on how designing anything has to take serious consideration of who is using your product and in which context it’s being used. being inspired by nature or integrating nature itself in your project, (reminded me of the MIT silk pavilion: https://vimeo.com/67177328 ) your project has to consider natural behaviour of the user and the environment it will take action. design projects have to be thought through as a system, not an isolated object in the world. and in this line of thinking, the article “Why The Human Body Will Be The Next Computer Interface” points out that the future is walking towards a more humanized, less sci-fi machine-human interaction and/or integration. Through the evolution of computer, Fjord shows that human have been designing things in a more intuitive way of interacting with machines and how the ultimate future of computer will be the the use of our most daily routine activities and involuntary gestures as input to machines – reaching the point in which the body is the interface itself. Although I do think that this is where we are walking towards to, I do have to say that I’m very suspicious on how natural the gestures and behaviors that will work as input in fact are. the example Fjord gave, even though seems natural when described without the machine-integration, looses all of its organic aspect once you introduce all this technology in the flirt situation. And it’s not only a fear of mine on how this integration might make involuntary activities less natural, but also how we as creative thinkers that are on the top of the innovation chain can push people to act/behave in certain ways and in such a subtle manner that we make people perceive these new actions as an inherent gesture. But there’s also silver linings about intervening how we behave to make life better: I think in specific cases such as the two interviews on the “Designing the human body is becoming more of a reality”, changing human behavior/perception was an interesting alternative for disabilities that are still hard to understand how to come through them. After doing the readings I got very inspired on narrowing down the project considering that a smart commuter should not only be a better commute for who is commuting but also for the place where it takes. 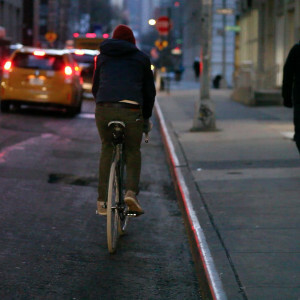 Therefore, I decided that my project will be a sign system for bike commuters and for the urban space it happens. 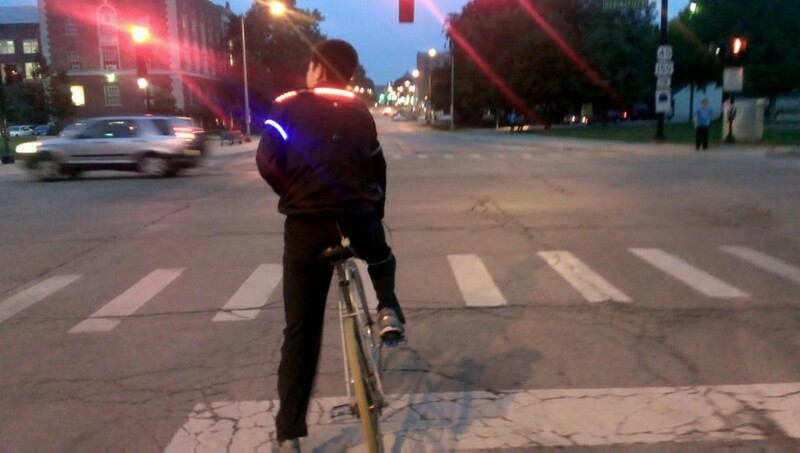 So the idea is that the biker is sent a signal when he/she needs to turn as well as he’ll have elbow patches that will light up, letting other bikers/people/cars behind what he’ll do. Ideally, this would be connected to a gps, so it would work by tracking your position. which materials will it be made of? how it will light up? how will it vibrate or signalize ? will it be independent from the garment? will it be independent from energy? how to use the bike’s energy to energize the system?